When I saw this on 3 Hungry Tummies, it looked so so delicious. When I served this for dinner, everybody says it's so delicious. 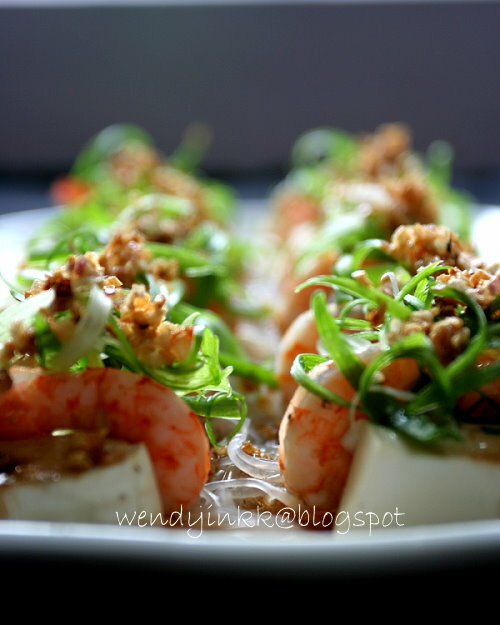 Credits to 3 hungry tummies for creating this yummylicious dish. 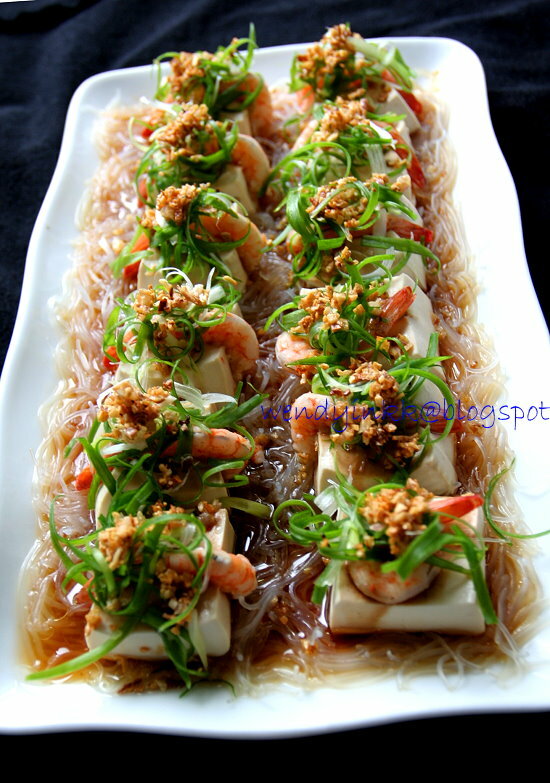 I did some minor adaptations, by lining the base with glass noodles instead of wrapping the tofu with it, so that the glass noodles will have juices from the tofu and prawns because glass noodles need a lot of liquid during the cooking process. And I also used soft tofu, instead of firm tofu. It's actually very simple, not much rules here. As many prawns as per pieces of tofu. As much glass noodles as you like, just soak them until they get soft before you use them. Sliced spring onion for garnish, and definately extra aroma and flavour. 1. 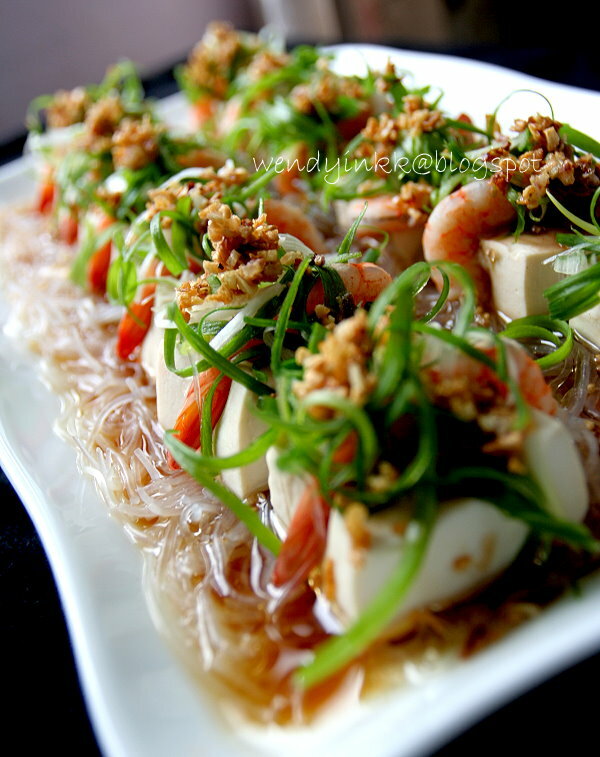 Soak glass noodles until soft, Drain and snip shorter. Place in steaming dish. 3. 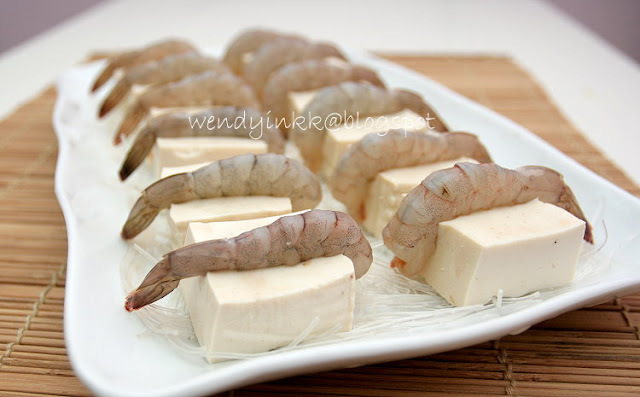 Arrange one piece of prawn on each tofu. 4. Steam on high heat for 10 minutes. 5. Drizzle with garlic oil and light soy sauce and top with sliced spring onions. Thanks for the shout Wendy :) Your version looks marvelous! I was wondering what tofu dish to cook tonight! This looks simple and delicious, gonna make this for sure, yum! Thanks! This sound so simple and good. Wendy, this is so good, so easy yet delicious. I'll probably just eat it up without rice! Wow .... so delicious. I wanna book mark this. the garnishing looks attractive and is healthy too! Looks so delicious! I like how simple it is to prepare. Great for impressing guests! I am definitely making this! Am sure your fAmily will want to have this again and again... Will you cook this again? Some will prefer without the garnish, those who hates spring onions, LOL. LOL, am not sure. Not near future I guess. Haven't been cooking dinner for 2 months. Haha. Wuah, like from 5-star hotels/fine dinning restaurants har...some more soak the spring onions to make them curl...? hi wendy. =) Very nice recipe, but I was wondering how do you cut the spring onion to look so nice for garnish? Thanks! May I know what's the tiny bits on top of the tofu? Is it fried garlic? As said in the method step (5). How do you prepare the garlic oil? Is there any difference to drizzle the soy sauce after steaming and before steaming? 1. Just saute the chopped garlic with oil until golden. 2. Yes. If u use the soy sauce before, your tofu will be stained, plus the water from tofu will leak out even more due to osmosis. If you add soy before the oil, it will also stain. So up to you. 3. Yes you can, but after steaming please. Does the garlic oil need to be very hot or can the garlic oil be prepared few days earlier? Thanks ! Looks amazing and amazingly simple! One thing I'd suggest is to de-vein the prawns.